If you like fig newtons you are gonna love this healthy raw alternative! Figs are fat-free and a great source of potassium, calcium, iron and fiber. Keep in mind that dried figs are naturally high in sugar and eat accordingly (meaning you should always try to stay within the normal daily recommendations for sugar). These are a perfect sweet treat for kids to enjoy with a cold glass of milk. The ingredients are simple and few and they're easy to make. This version of an old favorite is gluten and dairy free, raw and vegan. 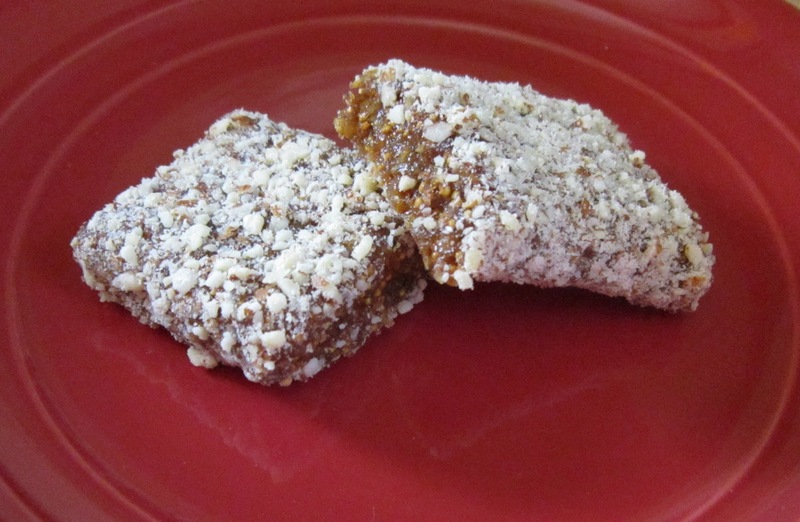 Grind nuts using s-blade of food processor into coarse flour; dump onto a large piece of wax paper. Place cut up figs, cinnamon and salt in food processor and pulse while adding lemon juice a bit at a time until well incorporated. This should be quite thick. I like to refrigerate it for a couple of hours so it's easier to handle. Divide into quarters and shape each into 7-8" logs; flatten between sheets of parchment or wax paper and roll in the reserved ground almonds. With a sharp knife cut each piece into 4 or 5 portions. Store in fridge. They do look very good and actually quite like these food bars I was recently sent to try out by Nakd bars. Scrummy snacks that are good for you. I love figs, especially dried figs. I eat them and dried dates quite often! Great post! Glad you found your way back. I hope you will try making these fig newtons - they are ridiculously easy and delicious - and let me know how you enjoyed them! These are,absolutely delicious! I,was the lucky recipient of a fab care package of which a little box of these,was included. I just love them! Thanks sis!